Shooting flames popped out of a condominium complex in Walnut Creek early Wednesday, but residents living inside the building were able to escape unharmed, according to Contra Costa County Fire Battalion Chief Mike Quesada. Pete Suratos reports. Shooting flames popped out of a condominium complex in Walnut Creek early Wednesday, but residents living inside the building were able to escape unharmed, according to Contra Costa County Fire Battalion Chief Mike Quesada. 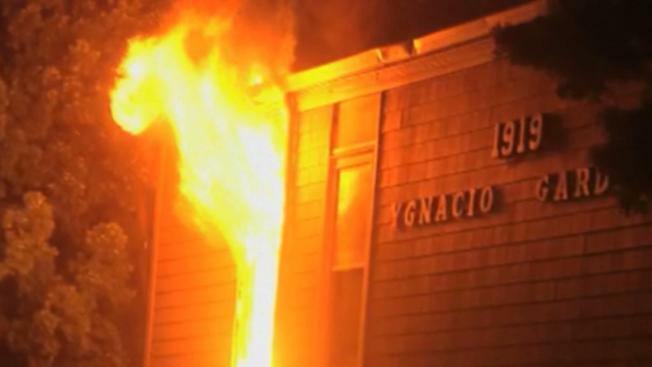 The blaze, which ignited at the Ygnacio Gardens Condominiums located at 1919 Ygnacio Valley Rd., was called in around 12:20 a.m., according to Quesada. Arriving firefighters witnessed flames flowing from a second floor window, Quesada said. A total of seven fire units and 30 firefighters were able to knock down the blaze, according to Quesada. No injuries or rescues were reported, but two families were displaced, according to Quesada and the Red Cross.